Muferiat Kamil (M), chairwomen of SEPDM. In a statement issued yesterday after an emergency meeting of the central committee which was called to discuss the situation in the region, the party rejected movements in some zones to end their relationship with the regional state and be state on their own. 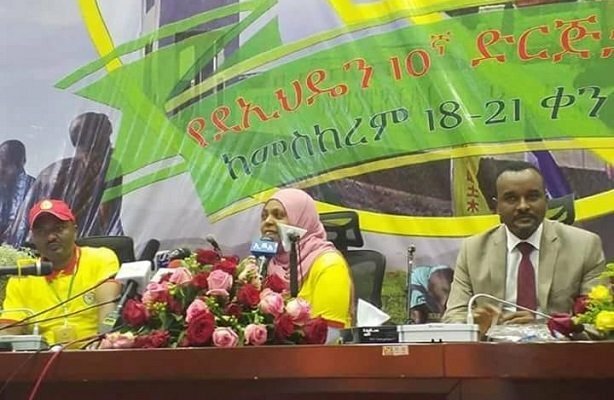 Councils in Sidama, Wolaita, Kembata and Guraghe zones have unanimously voted in favour of ethnic based regional statehood. The party further claims that a study is underway in relation to administrative arrangement and that new administrative structures with a legal framework of the regional council will be established upon completion of the study. The statement from the party further said a committee drawn from experts and intellectuals is formed to study demands for statehood, and outcome of the study will help deliberate on the demands. And the party made it clear that any other moves outside of these processes and procedures are not in line with the directions which the 10th congress of SEPDM whose chairperson, Muferiat kamil, is appointed to the most powerful ministerial position in the country, Ministry of Peace. As well, the party seem to have resolved to fight lawlessness and anarchy for it sternly warn shutting down institutions and limiting freedom of movement of citizens will not be tolerated. Unlike other regional states, the region is home to well over 50 ethnic groups and has recently experienced ethnic based violence that has caused serious humanitarian crisis including displacements of thousands of people. 2 Responses to "SEPDM warns against political moves for statehood in the region"
Did Muferiat Kamal supported the Siltes to split from Gurages and to get their statehood so that they can steal, collude and be lackey of Woyanes? If she did, she has not standing to lecture others. Did Muferiat Kemal oppose the Siltes from breaking away from Gurages to collude, to be lackeys and thieves with Woyanes? If not she has no ground for opposing others to seek statehood.